[[File:Grandma_in_House_(2010).jpg|right|400px]]For a quarter of a century, Barry Lubin, better known as ''Grandma'', his clown persona, has been the iconic face of the Big Apple Circus. Although his career began and continued with other circuses in the U.S. and in Europe, to many New Yorkers and Bostonians in particular, Grandma ''is'' the Big Apple Circus. Many felt a strong sense of loss when he bid farewell to the Big Apple Circus's audiences in 2012: They had laughed at Grandma's antics when they were children, and in turn, their own children were growing up laughing with Lubin's beloved character. Thankfully, he returned to the Big Apple Circus for its Lincoln Center revival season in 2017. [[File:Pinito_del_Oro_on_trapeze.jpeg|right|300px]]Pinito del Oro (1931-2017) was a genuine circus star, an iconic personality of the Spanish entertainment scene, and one of the world’s top aerialists in the 1950s and 1960s. 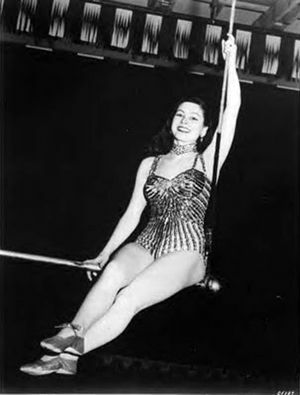 Beautiful, with a natural elegance and a radiant smile—and indeed extremely talented—she was featured with her outstanding Washington trapeze act in Europe’s most prestigious circuses, and had been a center-ring headliner with Ringling Bros. and Barnum & Bailey Circus in the United States for seven consecutive seasons. She was also courageous and resilient: she survived three near-fatal accidents, and each time resumed her precarious career on the trapeze. Barry Lubin was born July 3, 1952 in Atlantic City, New Jersey, the son of Edythe Weinberg Lubin, a homemaker, and George Simon Lubin, an audiovisual engineer. Barry nurtured hopes of becoming a television director, but the social turmoil of the late sixties and early seventies led to a period of self-questioning—as indeed it did for many disappointed youths at the time.